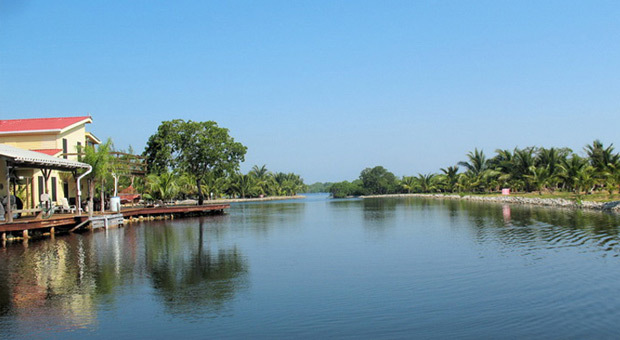 Water and history are the defining elements at Coconut Lagoon. Water surges in clockwork rhythms on its shores, through its canals and pools. And history stands watch from the grounds above. . From the centuries-old beams of the heritage mansion to the carved woods of the reception,the past comes alive as liquid reflections, mirrored in ripples and shards wherever you look. Fittingly, Coconut Lagoon can be reached only over the water. (See map).The great Vembanad lake, an inland sea that stretches clear across central Kerala, forms a breeze-laden watery highway. Your coach transfer happens via a generously clunky wooden boat with a little inboard motor (so as not to disturb the fishes). And the lobby, when you arrive, turns out to be a reconstructed 19th century mansion with a stone jetty attached. Your boat putters sedately through a narrow canal, its banks covered with flowers. Tiled-roof bungalows peer through the foliage. And with a reviving coconut cocktail in one hand, you step off the boat and up to the reception desk, all ready to check in. Conde’ Nast Traveller once described Coconut Lagoon as one of the 25 best destinations in the world. Our guests tell us that the journey inward is an experience to match.